Getting rid of the Weber Charcoal Grill? Tired of that Propane grill that you have to roll out every time you barbecue? 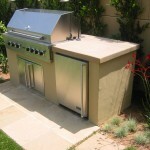 Horizon Landscaping can build you a reasonably priced Built-in Barbecue Center hooked up directly to your Natural Gas Line. No more running out of propane! 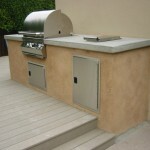 We Design and Build Custom Barbecue Centers. A Built-in Stainless Steel Barbecue Grill set in a Custom Countertop Cook Center Designed Specifically for your Backyard Patio. As you can see from our Photo Gallery, We work with many different Masonry Materials. 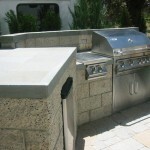 One of our Specialties is Concrete Countertops blended with a variety of choices for the masonry finish on ‘The Face’ of your Barbecue Center. 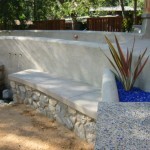 Our Concrete Countertops are Formed and Poured-in-Place. We mix a color additive in our concrete so every countertop is tailored specifically for you. There are many color choices. We use concrete color blends by ‘Colorfull’ Admixtures Inc. and Davis Colors. These are non-fading, durable color pigments that will last the life of the concrete. We “Finish” our Concrete Countertops to a smooth slick “Steel Trowel” finish. Polishing the surface with powerful polishing wheels, using finer and finer ‘Grit’ until the desired finish is achieved, then a Concrete Sealer is applied. We also do Tiled Countertops with a Tiled Backsplash, just like in your kitchen at home and we have Master Tile Installer’s to ensure precision cuts and Quality Installations of the tile of your choice. When it comes to countertops we have worked with a wide variety of materials, Caesarstone, Soapstone, Granite, Ceramic Tile, Stone Tile, etc..
We can help walk you through The Pros & Cons when selecting the right countertop material for you. 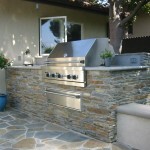 For the ‘The Face’ of your Masonry Barbecue Center, we usually take cues from your homes architectural style. 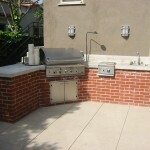 Be it Brick, Stone or Stucco, we are experts in masonry and take pride in our ability to match your new barbecue center to the existing finish of your home. 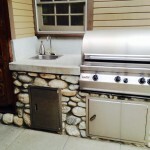 The costs of a new custom masonry bbq center varies according to size, the countertop and face material, how far your gas meter is, and of course the cost of the stainless steel grill itself. 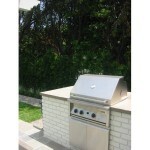 There are also many accessory item options such as Outdoor Refrigerators, Side Burners and Sinks. 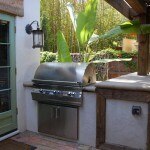 One Accessory we always like to suggest along with your new grill is a sink! Even if it’s just a small 12″x12″ Bar Sink, I find it so useful and convenient. We also always like to suggest an Outdoor 120volt Electrical Outlet. If you ever want the grill’s optional rotisserie that will require an outlet within 3′ of your your grill. And it’s just handy to have a plug for things like your radio or bluetooth speakers. So of course if you add a sink, you need plumbing. You add an outdoor electric plug, you need an electrician. With Horizon Landscaping, that is no problem! 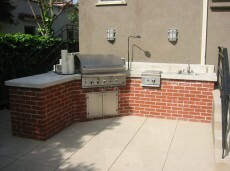 We are a State Licensed General Contractor and can handle any facet of your new Barbecue Center Installation. Also we are Bonded, have General Public Liability Insurance and Worker’s Comp Insurance. We have installed so many BBQ centers, so why not go with a professional that has the experience, is honest and will give you a fair price.